The New York Yankees’ Alex Rodriguez will play his final MLB game on Friday, taking place in the team’s home stadium in the Bronx against the Tampa Bay Rays. But how do ticket prices matchup to Derek Jeter’s final game just two years ago? In short: they don’t. After the initial surge in price for Friday’s game, we have seen prices drop 31 percent since Sunday, indicating that there is not as much demand for Friday as ticket sellers expected. Prices are still more than double where they were before the announcement, but they have been falling consistently over the past few days. 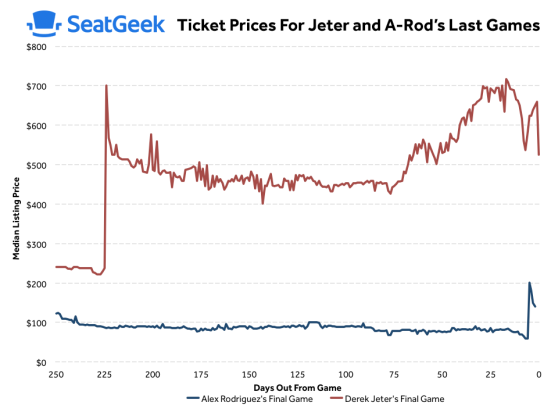 While we saw a similar trend for Jeter’s last game, even with the drop the prices were still far higher than the peak of prices for A-Rod’s final game. On the day of the Jeter game the get-in price was $200, right now for Friday’s game it is $38.